Unstable angina is a condition in which your heart doesn't get enough blood flow and oxygen. It may lead to a heart attack. Angina is a type of chest discomfort caused by poor blood flow through the blood vessels (coronary vessels) of the heart muscle (myocardium). 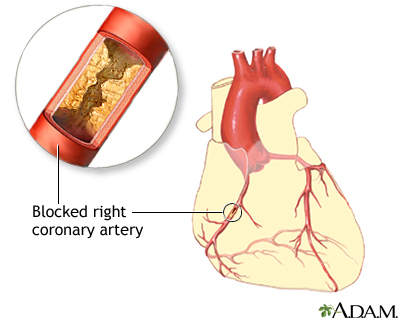 Coronary artery disease due to atherosclerosis is the most common cause of unstable angina. 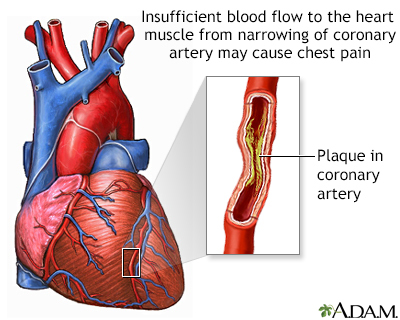 Atherosclerosis is the buildup of fatty material, called plaque, along the walls of the arteries. This causes arteries to become narrowed and less flexible. 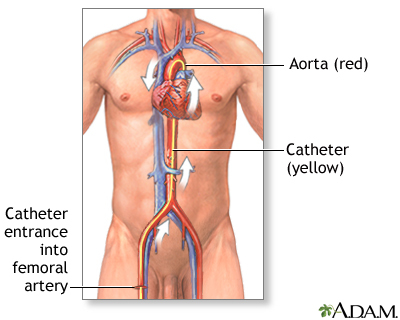 The narrowing can reduce blood flow to the heart, causing chest pain. People with unstable angina are at higher risk of having a heart attack. With stable angina, the chest pain or other symptoms only occur with a certain amount of activity or stress. The pain does not occur more often or get worse over time. Unstable angina is a warning sign that a heart attack may happen soon and needs to be treated right away. See your health care provider if you have any type of chest pain. The provider will do a physical exam and check your blood pressure. The provider may hear abnormal sounds, such as a heart murmur or irregular heartbeat, when listening to your chest with a stethoscope. Blood tests to show if you have heart tissue damage or are at a high risk for heart attack, including troponin I and T-00745, creatine phosphokinase (CPK), and myoglobin. The myoglobin blood test measures the level of the protein myoglobin in the blood. Myoglobin can also be measured with a urine test. Stress tests, such as exercise tolerance test (stress test or treadmill test), nuclear stress test, or stress echocardiogram. 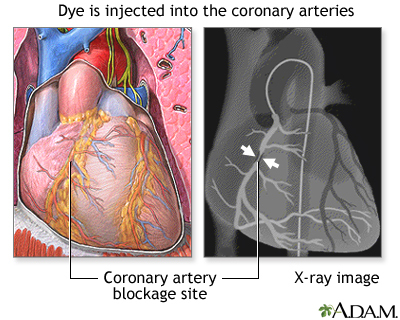 Coronary angiography. 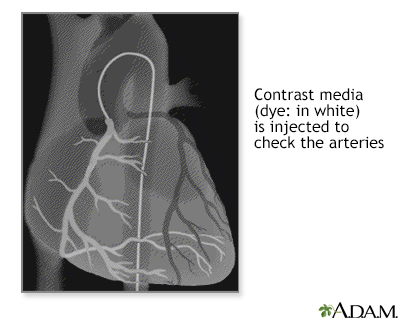 This test involves taking pictures of the heart arteries using x-rays and dye. It is the most direct test to diagnose heart artery narrowing and find clots. You may need to check into the hospital to get some rest, have more tests, and prevent complications. Blood thinners (antiplatelet drugs) are used to treat and prevent unstable angina. You will receive these drugs as soon as possible if you can take them safely. Medicines include aspirin and the prescription drug clopidogrel or something similar (ticagrelor, prasugrel). These medicines may be able to reduce the chance of a heart attack or the severity of a heart attack that occurs. You may get heparin (or another blood thinner) and nitroglycerin (under the tongue or through an IV). Other treatments may include medicines to control blood pressure, anxiety, abnormal heart rhythms, and cholesterol (such as a statin drug). A procedure called angioplasty and stenting can often be done to open a blocked or narrowed artery. 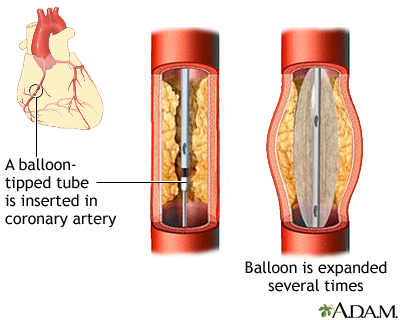 Angioplasty is a procedure to open narrowed or blocked blood vessels that supply blood to the heart. 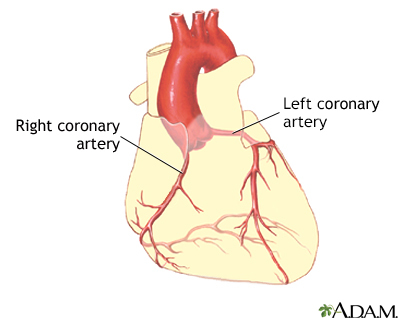 A coronary artery stent is a small, metal mesh tube that opens up (expands) inside a coronary artery. 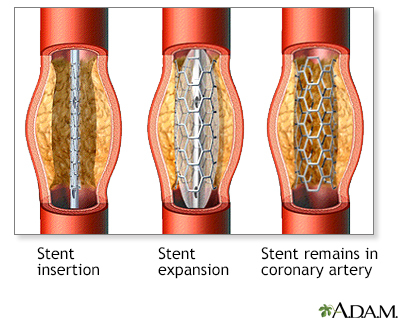 A stent is often placed after angioplasty. It helps prevent the artery from closing up again. 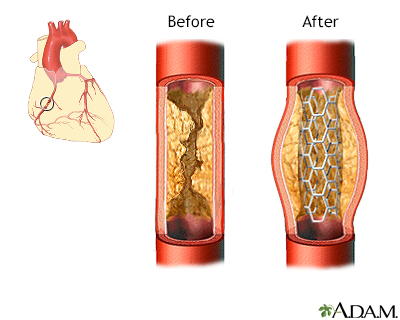 A drug-eluting stent has medicine in it that helps prevent the artery from closing over time. Unstable angina is a sign of more severe heart disease. Abnormal heart rhythms and heart attacks can cause sudden death. Seek medical attention if you have new, unexplained chest pain or pressure. 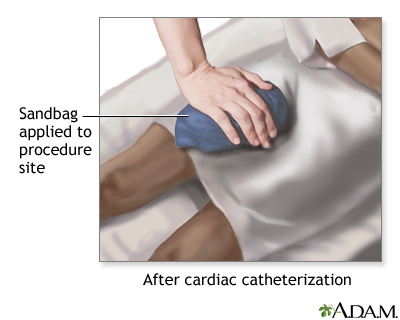 If you have had angina before, call your provider. If you think you are having a heart attack, get medical treatment right away. Your provider will also recommend that you keep other health conditions such as high blood pressure, diabetes, and high cholesterol levels under control. If you have one or more risk factors for heart disease, talk to your provider about taking aspirin or other medicines to help prevent a heart attack. Aspirin therapy (75 to 325 mg a day) or drugs such as clopidogrel, ticagrelor or prasugrel may help prevent heart attacks in some people. Aspirin and other blood thinning therapies are recommended if the benefit is likely to outweigh the risk of side effects.